I would argue that there is a great difference between an 8 and a 5. The 5 would play at the 4 in their second game if the seedings hold; whereas the 8 would play at the 1 in their second game. LARGE difference. boulder3m wrote: I would argue that there is a great difference between an 8 and a 5. The 5 would play at the 4 in their second game if the seedings hold; whereas the 8 would play at the 1 in their second game. LARGE difference. My opinion is that they are all going to be hard (if we're good we're gonna have to play a tough team at some point one way or another)and I would rather play in a game with a similar climate to what we're used to (i.e more geographically close) and minimize flight/general travel time. I think the cold weather effected us against Youngstown more than we think, especially on special teams. It effected them too (they missed kicks, etc), because quite frankly the pros are probably the only teams that play in <30 degree weather regularly. There's a reason why UNI, NDSU and teams in the Dakotas, Montana, Idaho, etc play in Domes and it's not for pageantry. I also think jet lag can be a problem too. There's some NFL stat that teams that play the Seahawks (most geographically isolated team in the NFL) do worse the week after traveling to the Seattle (or at least there was at one time). I think the same principle applies and we anecdotally saw that against Richmond in 2007. To be honest with you, part of the reason why I was content with our effort against Youngstown (in spite of being in position to win the game multiple times) is because I honestly didn't think we could beat EWU doing back-to-back long trips. Admittedly, I don't have a lot of Wofford-related data to support this hypothesis, but it's just my opinion. I know it makes us a look better to go as deep into the playoffs as possible (and it feels good too), and to do that we need more home games and higher seeding, but really it's slicing probabilities either which way. We can't help who we play and we know they are going to be good either way. We're not getting into the top 4. So I'd rather have the geographically optimal bracket for us (more home games, and if road games, drivable games), and being in JMU's bracket would afford that opportunity in my opinion. 5th or 8th may (and a very big MAY) make some difference in how the playoffs shake out for the Terriers. Yes, whatever team WOF draws will be a toughie, no matter what. I had rather they play someone out of their (wheelhouse) just from a fan standpoint. I would like to see (if not WOF) some other SoCon team go as far as possible in the playoffs just for the exposure for the conference. If WOF winds up having to play a FU or WCU or Samford somewhere along the line, so be it! But I hate to see any same conference teams take each other out in the early rounds. Sort of a "share the wealth" mentality, I guess.......go Terriers. I don't think we'll play Samford, just because I think they are more likely to play Jacksonville State or Central Arkansas based upon geographic proximity, while we're more likely to play the winner of whoever furman plays. Western Carolina may need an upset against UNC to make the playoffs. The way this season has gone for UNC they may not have enough players to beat Western. I'd rather not play a SoCon team in the playoffs, but it is likely to happen. It's tough for a good team to beat another good team twice (The Citadel last year, Georgia Southern years ago) and reputation is not built by beating conference teams, it is built by stepping outside of the conference and winning against other teams on a big stage. That might be in our favor if we drew Samford, but Furman would be a tall order with the kind of motivation they would have although playoff experience would be a benefit to us in that hypothetical matchup. Outside of the gigantic Montana win, Wofford doesn't have any really big playoff scalps. Western Kentucky in 2003 may have been the defending champs, but that team had lost a bunch and Jacksonville State had not yet arrived at the time we beat them. New Hampshire was a solid team, but down by there standards when they came to Spartanburg, too. The Terriers have had their chances. You can't cumulatively come much closer than we did with James Madison, Northern Iowa, North Dakota State and Youngstown State. Win a few of those and it's a totally different feel around the program come December. This isn't to say that Wofford chokes in the payoffs, but it does mean that the Terriers need to win some intersectional games and move the national perception from being a respected program with a quirky offense to a fear program that ends people's seasons. +1....Spoken like I wish I could.....thanks Eyes! Notable losses today Illinois State, North Dakota State, and South Dakota all go down this weekend. We're not going to be rewarded for a 3 point win against a 2 win team, but then again more than 1 top 20 team was taken to OT by a sub-.500 team. I hate to sound negative, but honestly I'm not even thinking playoffs right now. I don't have enough confidence in our ability to play a complete game against decent competition. 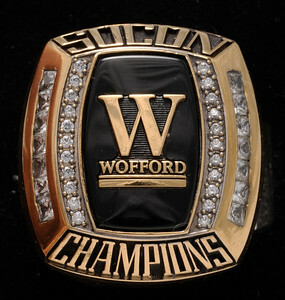 I'll be happy with the socon crown, everything else is gravy. * 7 Elon wins in double overtime; BTW...they come to play the locals (UNH) for a HUGE game this Saturday. Predict the Wildcats will win and make a statement to solidify their playoff slot for the 13th straight year. Sorta pulling for UNH in that one. It's more likely that SDSU jumps us and that South Dakota barely falls. We're probably going to lose a seed because we don't win games impressively enough. Can’t see either running table... Very tough outs... At best, 1-1... We win Saturday and we will be the 6 seed... McLaughlin and Haley do a great job on Twitter with their projections also. In the So Con, I see Woffy, Western and the winner of the Furple and Sammy getting in.